(Boston, MA) 5 Lesbians Eating a Quiche imagines an alternative reality in which Sputnik was less a marvel of 1950’s Russian science and more a legitimate, non-propagandist threat to US security during the Cold War. It is 1956 and the members of the Susan B. Anthony Society for the Sisters of Gertrude Stein are holding a quiche appreciation luncheon. Sisters, behold the mighty egg: bringer of life, sustainer of women! The meeting begins joyously with a meeting of forks and ends after armageddon ravages the lands of the United States. The board members might be the only survivors. Yet, with the majestic egg to keep them strong, and their identities clearly defined, they will repopulate the earth. Somehow. This is a short, spunky play with incidental music. Like a neighborhood tom cat, It’s a bit rough around the edges but full of possibility. Our heroines are cute, full of life, and, like a Lifetime movie, are only loosely based on a true stories. Most importantly, the audience is a full participant in all the action whether it wants to be or not. Don’t fight it. Each of the ladies in the cast give something wonderful to the show. In general, the cast had us laughing and cheering with them. In particular, Elizabeth Battey and as the saccharinely devoted historian Dale and Erin Rae Zalaski as the faithful chairwoman Wren took the cake. Their commitment and audience engagement went above and beyond. The entire cast does an excellent job of breathing charming believability into the script. The set design by Michael Pelosi & James Sims was campy kitsch: very cute while still being an eyesore. The sound design, specifically the kicky soundtrack, by Deirdre Benson was sweller than swell. The hair by Nina Luby was peachy keen. There were only two drawbacks: 1. The audience had to work to hear some of the actors throughout. 2. An English accent was used in this production. It did not work. The lesson we learn from Hobgood and Linder in this never-Pulitzer winning, adorable show is not to wait for the world’s end to accept yourself for who are. It takes an earth shaking explosion for the Sisters to confront their most human of necessary truths but it needn’t. 1950’s or not, if you’re safe and willing, leap out of the closet, Ladies (and/or gentleman), into a succulent, fragrant quiche. 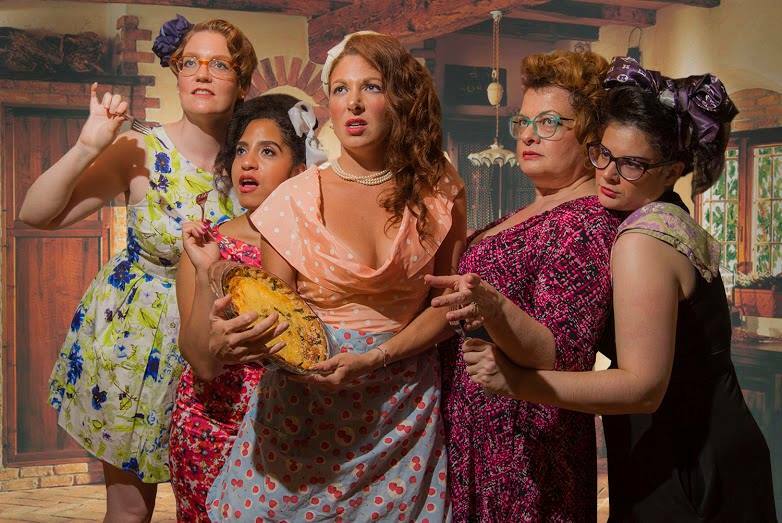 This entry was posted in Comedy and tagged 1950's, 1956, 2015, 5 Lesbians Eating a Quiche, Beth Stelling, Boston, boston center for the arts, Deirdre Benson, Elizabeth Battey, Erin Rae Zalaski, Evan Linder, Evan Linder and Andrew HobgoodAndrew Hobgood, Heart & Dagger Productions, James Sims, Joey C. Pelletier, Lifetime movie, MA, Maari Suorsa, Mary Hollis Inboden, Meg Johns, Michael Pelosi, Nina Luby, October, Pulitzer, quiche, Russia, Sarah Gitenstein, Sputnik, Susan B. Anthony Society for the Sisters of Gertrude Stein, The Cold War, Thea Lux by Kitty Drexel. Bookmark the permalink.